Cone rod retinal dystrophy characteristically leads to early impairment of vision. An initial loss of color vision and of visual acuity (due to loss of cone function) is followed by night blindness and loss of peripheral visual fields (due to loss of rod function). the child touching her eyes with her fingers as though she were poking them. Parents will often notice these signs by the way the child acts. 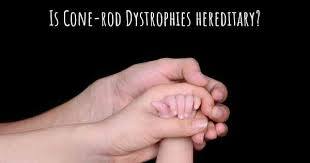 Most cone rod dystrophies are genetically based and result from "misprints" in a child`s genes, and are typically carried forward from the parents` genes although sometimes by chance a new mistake occurs in the child`s genes and the parents` genes are normal. There is no known cure for cone rod dystrophy, although homoeopathic medicine is showing promising vectors that may replace damaged muscle tissue. Treatment is generally aimed at controlling the onset of symptoms to maximize the quality of life, prevent further detoriation leading to gradual improvement in vision of patients. One can notice symptomatic improvement within 3-4 months of treatment. Duration of treatment varies with the severity of disease. We have documented up to 80% improvement in our patients.